Four useful desk accessories in one. A complete desktop weather station. 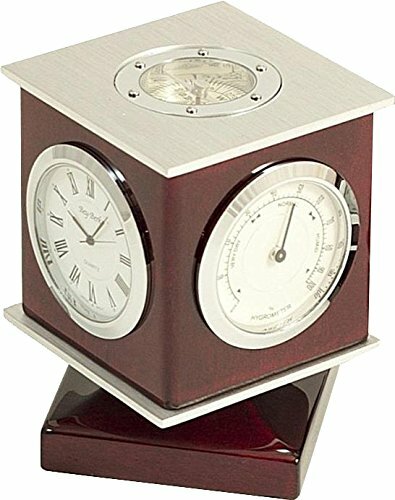 The cube Rosewood Weather Station with Clock, Thermometer, Hygrometer, Compass Top with rotating swivel base is an ideal gift idea and a fine accessory. Finished in a plated silver exterior, this includes four round dial instruments: compass, clock, thermometer and hygrometer. Excellent choice for the weather buff, geographer, or engineer. Rotating base allows easy viewing of each instrument. A stylish complement to your desktop accessories. Also includes an engraving plate that can be personalized. This is offered at a great price. Dimensions: 3 x 3 x 4.